Call today for all of your POP solutions! How do I load a Clip Strip® Merchandiser? What about cartons for loaded Clip Strips? What do you need to know about my packaging? Which Clip Strip® Merchandising Strip is right for me? 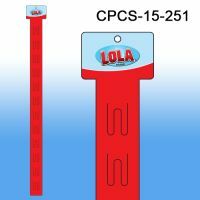 Clip Strip® Brand Merchandising Strip - "The Original"
Posi-Lok™ by Clip Strip Corp.
Econo Strips by Clip Strip Corp.
Sticky Strips™ by Clip Strip Corp. Which Clip Strip® is right for me? How do I load a Clip Strip®? 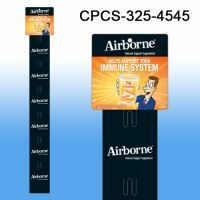 Custom Printed Clip Strip® Merchandisers are now a reality! We know they have been hard to afford in the past, but that problem is solved here at CSC, thanks to our new proprietary process to manufacture shorter run PRINTED display strips at cost efficient pricing. And we even have multiple versions available without any set-up fees at all, see our stock tools sizes here in this section. 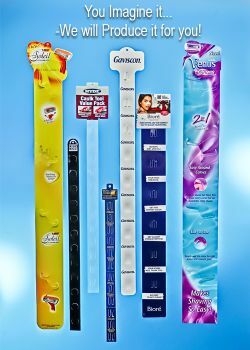 Trust your Custom printed merchandising strips to Clip Strip Corp., the inventors of the product. Die cut flat strips are the standard custom printed clip strips. Your die cut can range from standard squared off headers with three-prong finger style hooks on the vertical stem to custom shaped strips with varied hook styles, it's really up to your designer's imagination. We can print short runs on digital presses in 4 color process, and offset up to 7 and 8 colors if that is called for with your corporate branding. We know that a stock Clip Strip ® Merchandiser may not cut it for certain brands with their marketing and merchandising standards; therefore we offer the option to manufacture fully customized display strips with your colors/design, etc. either only on the header, on the entire strip and/or they could be printed on both sides if hanging in aisle violator or flag fashion. 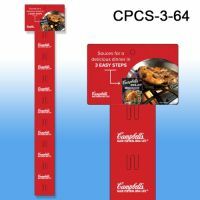 You will surely make an impact and stand out in crowded retail environments with a custom branded Clip Strip ® Merchandiser. For a quote or information contact us via this our online form or via Toll Free Phone at 1-800-4-Clip-Strip (425-4778). Minimum quantity for "Custom Printed Clip Strip® Merchandiser, 12 Hooks, O.D. 3-1/2" W x 26-1/4" H, CPCS-15-354" is 100. 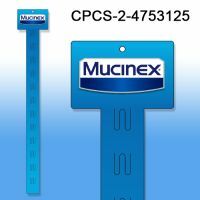 Minimum quantity for "Custom Printed Clip Strip® Merchandiser, 12 Hooks, O.D. 2-1/2" W x 23-1/2" H, CPCS-15-251" is 100. Minimum quantity for "Custom Printed Clip Strip® Merchandiser, 12 Hooks, O.D. 4-3/4" W x 28-1/4" H, CPCS-2-4753125" is 100. Minimum quantity for "Custom Printed Clip Strip® Merchandiser, 12 Hooks, O.D. 4-1/4" W x 28-1/16" H, CPCS-15-425425" is 100. Minimum quantity for "Custom Printed Clip Strip® Merchandiser, 6 Hooks, O.D. 4-1/2" W x 29-15/16" H, CPCS-325-4545" is 100. Minimum quantity for "Custom Printed Clip Strip® Merchandiser, 8 Hooks, O.D. 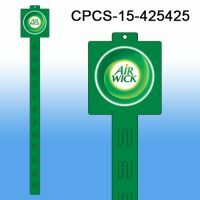 6" W x 28-7/8" H, CPCS-3-64" is 100. Orders under $100.00 are subject to a $10.00 Small Order Charge. © 1994 - 2019 Clip Strip Corp. Clip Strip® is a registered trademark of Clip Strip Corp.